I refer to an article of the Samoa Observer of 17 Nov 2017 (Pay your taxes, P.M. tells Church Ministers) that was based upon a media session with the Prime Minister last week. The outcome of the media session to me as a Christian was successful. That is, the Prime Minister has been caught by the truth during the media session and as a result, there is no more hiding space for him to hide from our eyes. It was a victorious moment. The Prime Minister’s next move will be very interesting because I don’t know where he is going to take the cover-up for the new tax law from there. No matter how hard he tries in order to cover-up the government’s mistake, he will never be successful because he is dealing with the truth. There is no one can beat the truth because God is the truth. The Prime Minister can still run away where ever he wishes to run to in order to avoid the truth, but he can’t get away from it. The truth will always pursue him and expose him infront of Samoa. The false accounts of the Scripture and another disrespectful behavior towards Church Ministers will surely jeopardize the H.R.P.P. brand sooner or later. Since the beginning of this discussion regarding the new tax law, he never mentions anything from a Biblical perspective about the Law of God about priesthood as well as the Law of God about tithe and offerings for priests. According to the media session, he just brought up a Scripture about authorities from God and then generalizes everything about authorities from one or two verse(s) of the same chapter. According to him, that was the authority, which led him and the government to establish the new tax law. He referred to that situation as the truth. Also, when he presented his interpretation about things belong to Caesar, he implied himself as Caesar. In other words, he implied our Christian government as the government of Caesar which really means that Samoa is still under the control of a pagan government. He just put up things that way and that was it. He didn’t care about differentiating of the authority of God from the authority of man in terms of the Law of God and the law of man. As a man of the law like the Prime Minister and as a Prime Minister of our Christian country, he should always stand up for the Law of God and respect the sovereign of God. He is obsessed with and possessed by the laws of government such as tax laws and others however, when it comes to the Law of God, he closes his mind and then the Law of God becomes irrelevant. Now, the Church is irrelevant, our country is irrelevant and Church Ministers are irrelevant. In other words, we are stupid and our fore-leaders are stupid. Every thing we are saying for a positive solution about the new tax law; do not have anything meaningful or nice with him. Even all Bible scholars in our churches and in our country do not have a place in our government. They don’t fit in into the Prime Minister’s realm of scholars. The Prime Minister is right about what the Apostle Paul has said about authorities from God. However, it does not mean that the Prime Minister has the right and the authority over God so that the Prime Minister can establish a tax law against the Law of God regarding priesthood and the Law of God regarding tithe and offerings for priests to inherit that are kept and followed by the Church and Samoa. The Prime Minister is not God and government is not God. So the authority of the Prime Minister and government is limited by God. It means that God’s authority is “sovereign”. As the Sovereign, Jesus is not subject to a law of man as well His own Law (that is given for man) because He is sinless and He is the law Maker. On the other hand, we understand that Church is not God and a Church Minister is not God. However, they are exempted or free from taxation like Jesus not because they are Law Makers like Jesus but because of the Law of God. They are exempted and free from taxation by the Law of God (Hebrews 7). Accordingly, the Law of God about priesthood and the Law of God about tithe and offerings for Church Ministers to inherit, clearly draw the line between the authority of God and the authority of man. Jesus said, ‘All authority in heaven and earth is given unto me’, ‘He is Lord of the temple’ and ‘He is Lord of the Sabbath’. According to Paul, Jesus is the Head of every man and Jesus is the Head of the Church. It means there is no one has a right or an authority or a jurisdiction over Jesus. Therefore, the Prime Minister and H.R.P.P. are subject to the Law of God and it is their duty to give God what is God’s such as tithe and offerings for Church Ministers to inherit. Furthermore, let us have a look at the Prime Minister’s interpretation of the Scripture about things belong to Caesar. According to the same article by Samoa Observer, he said:“There were certain types of church ministers. There are the ones who read the Bible, understand that it is their duty ‘to give to Caesar what belongs to him’ and pay their taxes”. The Prime Minister was only specific about things belong to Caesar. He only spoke about things belong to Caesar but he did not mention anything about things belong to God. Why? I wish, the Prime Minister can go a little bit further and cover the rest of the verse and give a Biblical explanation to the media about things belong to God because that was his main target. He was targeting the priests’ inheritances from tithe and offerings that was commanded by God to be inherited by priests (Hebrews 7). According to the Prime Minister’s version of things belong to Caesar, he said that it is the duty of church ministers to give to Caesar what belongs to him and pay their taxes. The meaning of what he said is that God’s things such as tithe and offerings for priests to inherit according to the Law of God are Caesar’s. So he was thinking that God is subject to Caesar, the Creator is subject to His creation, the Law of God is subject to the law of the Prime Minister /H.R.P.P and the duty of God is paying taxes to Caesar. If those are the things belong to Caesar according to the Prime Minister then there are some important questions for the Prime Minister and H.R.P.P to answer. (1)What are the things that should be rendered to God if the duty of Church Ministers is giving God’s things to Caesar that do not belong to Caesar? (2)Did Jesus come to serve Caesar and Rome or the ‘will’ of God and Israel? (3)What is the fulfilling of the law? (4)What are the Law of God about priesthood and the Law of God about tithe and offerings for priests to inherit? In other words, show us the Law of God regarding priesthood and the Law of God regarding tithe and offerings for priests to inherit. (5)Is it lawful to tax God according to the Scripture? (6)If it is lawful to tax God like the new tax law of the Prime Minister/H.R.P.P then where did they get the ‘right’ or the ‘authority’ or the ‘jurisdiction’ to tax God? (Last one) Can the Prime Minister and H.R.P.P show us a record of Jesus paying taxes to Caesar? Because the Prime Minister interprets this passage as Jesus paying taxes to Caesar therefore, the Prime Minister is having the Kingdom of God being subject to the kingdom of Rome. Now, in our government, Samoa is having a new Scripture from the kingdom of Rome, the gospel of the Samoan Caesar. That is the Good News of the Samoan Caesar from Rome, the chosen nation of the Samoan Caesar. Mr. Editor, if we go through the Bible all over again and again to re-examine the Prime Minister’s interpretation and his ideal application of/for the Scripture about things belong to Caesar, we will always come up with the same conclusion that the Prime Minister’s interpretation of that particular verse about things belong to Caesar is a fallacy. The New Testament in the Bible is the Gospel of Jesus. It is about Jesus but not Caesar. So Jesus did not come to serve Caesar and Rome but His Father and His chosen nation of Israel. According to the Bible, Jesus never spends any time during His life time on earth in Israel to serve Caesar and Rome. In that same way, we as Christians are not here to serve Caesar or Rome. We are not here to serve the government either but the Gospel of Jesus or the ‘will’ of God. According to Jesus in (Matthew 5:17) “Do not think that I came to destroy the Law or the Prophets. I did not come to destroy but to fulfill”. So for the Prime Minister’s and H.R.P.P’s information, here are some of the many verifications of the Law and its fulfilling that is pointing directly to the Law of God about priesthood and the Law of God about tithe/offerings for priests to inherit. Law about Jesus as a prophet like Moses [Moses was a prophet and was also a priests / Jesus is anything] – (Deuteronomy 18:18) “I will raise up for them a Prophet like you from among their brethren, and will put My words in His mouth, and He shall speak to them all that I command”. Fulfillment – (John 2:45) (John 5:46) (Matthew 13:57) “So they were offended at Him. But Jesus said to them, ‘A prophet is not without honor except in his own country and his own house”. Law about priesthood and Law about tithe/offerings for priests - (Hebrews 7:5) “And in deed those who are of the sons of Levi, who receive the priesthood, have a ‘commandment’ to receive tithes from the people according to the ‘law’, that is, from their brethren, though they have come from the loins of Abraham”. Fulfillment – (Hebrews 7: whole chapter). Verse12 “For the priesthood being changed, of necessity there is also a change of the ‘law’”. According to the whole chapter, the ‘change of the law’ is referring to the new basis for priesthood, new order for tithe/offering and new order/criterion for priesthood. The new basis for priesthood is based on the order of Melgizedek. The new order for tithe/offering is based on tithe/offering Abraham gave to Melgizedek. The new order/criterion for priesthood is based on oath/promise [Abraham], oath/promise [Adam/Eve-Garden of Eden] and faith [Abraham]. The child of the oath/promise is Jesus and Jesus said to Israel in (Matthew 21:43) “Therefore say I unto you, The Kingdom of God shall be taken from you, and given to a nation bringing forth the fruits thereof”. Samoa is one of the fruits and Samoa received the Kingdom of God by faith [Abraham] through Malietoa. Samoa did not receive the Kingdom of God by law. The law is the old covenant [Old Testament] of God and Israel [chosen nation of God] but not God and the whole world. Therefore, apart from Israel, the whole world is called as Gentile. According to Paul in (Romans 9:30-32) “What shall we say then? That the Gentiles, which followed not after righteousness, have attained to righteousness, even the righteousness which of faith – But Israel, which followed after the law of righteousness, hath not attained to the law of righteousness – Wherefore? Because they sort it not by faith, but as it were by the works of the law. For they stumbled at that stumbling stone”. Gentiles became Israelite or Gentiles became descendants of Abraham by adoption through faith [Abraham] and that is how Samoa becomes part of the New Testament. Gentile Church Ministers are qualified under Abraham on two criterions. The oath/promise was given to Abraham and faith - Abraham’s faith. That is the ‘QUALIFICATION’ of our Church Ministers for priesthood and for tithe/offerings. Samoa is also qualified for Salvation on two criterions. The oath/promise was given to Adam and Eve [parents of the whole world] at the Garden of Eden (Genesis 3:15 / Galatians 3:17) and faith - Abraham’s faith or Malietoa’s faith - (Church Ministers and their duty in the work of God are also qualify under the same criterion) and remember (Gentiles become Israelite or Gentiles become descendants of Abram by adoption through faith [Abraham]). Because we are now Israelite or descendants of Abraham, therefore, Samoa becomes part of the Old Testament (Law of God) through the New Covenant of God and Israel as in (Jeremiah 31:31-33) (Hebrews 8:10) “I will put my law in their minds and write it on their hearts”. The Old Covenant was changed with the New Covenant on the arrival of Jesus the Owner of the Law and the fulfillment of oath/promises, Prophecies and the Law. Mr. Editor, that whole picture shows us that the Law of God about priesthood and the Law of God about tithe/offerings were not destroyed but changed or fulfilled. It was not changed or fulfilled by any Apostles but Jesus. But what is happening now with the law of God in our country? You know the answer Mr. Editor. Lau Susuga i le Fa’atonu, ua matua’i tele le fa’aletonu ua a’afia ai nei le Malo i le va ma le Atua. A toe tepa tasi i tua i le mafuaaga na momoli mai e le Ministry of Revenue na mafua ai ona ao lafoga a faifeau, e mata’utia le sese ma le fa’apaupau o ia mafuaaga. Fai mai le latou mau: (1) Ua ao lafoga a faifeau ona ua sili atu tupe maua a faifeau i ta’ita’i o le Malo. (2) E tatau ona fai se sao o faifeau i le atina’e o le atunu’u. E le fa’apea latou te fa’aaogaina auala a le Malo ma vai inu ae leai se latou sao i ia tulaga. (1) O fea se latou mafuaaga mai le Afioga Paia a le Atua o lo o faavae ai le Malo, e fa’amaonia ai le latou mau o le aoina o lafoga a faifeau? (2) O ai na faia auala? O ai na faia vai inu? Ni auala a le Malo? Ni vai inu a le Malo? O ai e ana le poto ma le atamai? O ai na faia le lagi ma le lalolagi ma mea uma lava o iai? O ai lea tatou te tapua’i iai? E na’o le popoto o o tatou laugutu e ta’uta’u le Atua, ae le’o iai o tatou loto ma o tatou agaga. I le ava tele ma lo’u fa’aloalo lava, o so’u lagona vaivai na’o a’u e tusa ai ma lenei mataupu ua tula’i mai. A’o le’i fofogaina se finagalo i se mataupu tuga e pei o le aoina o lafoga a faifeau, o le Atua ma lona finagalo e fa’amuamua. Sa tatau i le Malo ona fa’ataua ma tapena lelei ni ta’iala tatau e tapaina ai se finagalo o le Atunu’u aemaise lava i Ekalesia ma faifeau. 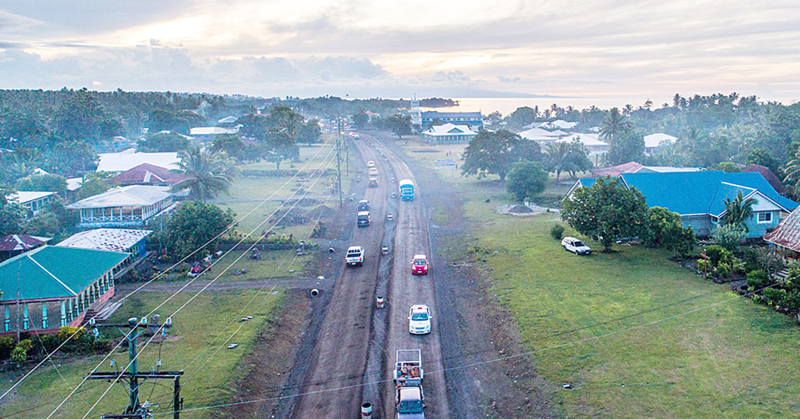 Afai ua tatou manatu e iai fa’aletonu o Ekalesia aemaise lava i faifeau, ua mafua ai ona oi tagata ma mativa ai Samoa, e le’o se mafuaaga tatau, e le’o se tulaga tonu, e le’o se tulaga sa’o foi lea e aiaina ai fua le Galuega a le Atua ma aoina ai fua lafoga a faifeau, ma soli ai le tulafono a le Atua. Afai o le finagalo lena o le Malo, o se silasila fo’i lena a nisi o le atunu’u i Ekalesia ma faifeau, ia e le fa’asaina lo tatou faitioina o Ekalesia ma faifeau. E taua faitioga e toe sasa’a ai tofa mo le toe faufauina o le aga’i atu i le lumana’i. E mafai ona momomoli a tatou faitioga i le ava fatafata ma le fa’aaloalo i le fa’asoa po o fautuaga i le fa’afesaga’i lelei ma faifeau ma soalaupule lelei mataupu i le filemu ma ala o le Atua. E mafai fo’i ona valuvalusia a’a o le fau e ala i tusitusiga fa’apitoa ma le taua e momoli i tusi, o News Paper fa’apea fo’i ma fono a Ekalesia. O ala mama na ma le manuia tatou te maua ai le tali manuia. Ae o le ‘kisi a Iuta’ e pei o le tulafono fou a le Susuga i le Alii Palemia ma le H.R.P.P. e ao ai lafoga a faifeau, e leai se mea aoga a Samoa e maua ai. E na’o le mafatia ai o alafau o Samoa e feliuliua’i i le ‘kisi a Iuta’, ae le’o mafatia ai fofoga i le Susuga i le Alii Palemia ma le H.R.P.P. O le tulaga la lea i nai Auauna a le Atua, ia usita’i ma le agaga fiafia i le poloaiga i le Susuga i le Alii Palemia ma le H.R.P.P. Tatou ui i le ala maualalo, tatou ui fo’i i le ala mamao. E manuia le tali o lo o fa’atali i le ala maualalo, faapea fo’i i le ala mamao. Ia faia ma le loto atoa ma le loto fiafia a outou lafoga, e le mativa le Atua. O le Galuega fo’i a le Atua o lo o outou auauna ai. Ia liliu fa’aletonu ma tulaga sese e avea ma mea aoga ma mea lelei mo Samoa, aemaise le Atua. O upu a Poasa i le fafine o nu’u ese sa i’u ina avea ma ona tofi – “Ia totogi Ieova i lau galuega, ia tu’uina mai ia te oe se taui tele mai ia Ieova le Atua o Isaraelu, ua e sau e fa’atuatua i lalo o ona apaau”.